FITZPATRICK BROTHERS is easily accessible from I-93, I-90, and the Arborway. We are also located just two blocks from the Shawmut "T" station on the Ashmont branch of the Red Line. The directions to our shop follow, or you can get exact directions via Google. 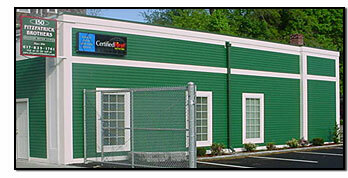 We are located at 150 Centre Street, in Dorchester. Our telephone number is (617) 825-1760. Our hours of operation are 6:30 a.m. to 3:30 p.m., Monday through Friday. Take I-93 North or South to Exit 11 (Granite Avenue/Ashmont). As you leave the exit ramp, you will be on Granite Avenue. Proceed on Granite Avenue. Turn left at the second stoplight onto Gallivan Boulevard (Rt. 203). Turn right at the second stoplight onto Dorchester Avenue. Drive one mile and turn left at the fourth stoplight on Centre Street, which is one block past Centre Avenue. Drive one block and bear left at the fork, continuing on Centre Street. Drive one block. At the intersection of Centre Street and Centre Avenue, take a right on Centre Street. Drive three blocks, and Fitzpatrick Brothers will be on your right-hand side. Take a right into the parking lot and enter through the door at the rear of the building. Take the Arborway (Rt. 203), continuing past Franklin Park. Continue on Route 203 (now called Morton Street). Bear left onto Rt. 203 (now called Gallivan Boulevard), which splits from Morton Street at the fire station. Turn left at the second stoplight onto Dorchester Avenue. Take I-90 east to I-93. Take I-93 south to Exit 11. Follow the "Driving Directions from I-93" instructions above.